They just don't build quality homes like this anymore! This beautiful custom home features 3 bedrooms, 3 bathrooms, and a 2 car garage on a private corner lot that's over 11,000 sqft. Boasting new flooring throughout, fresh paint, plantation shutters, beamed ceilings, raised wood baseboards, wrought iron stair rail, brick fireplace, custom cabinetry/ storage, wainscoting, kitchen overlooking the family room, and shows light and bright throughout. The kitchen has lots of white cabinetry, pantry, stainless steel appliances, a window looking out to your fabulous yard! The double door entry master bedroom has walk in closet and en suite private bath. Outside enjoy your huge private yard with covered patio, lush landscape, beautiful roses, and tangerine tree. 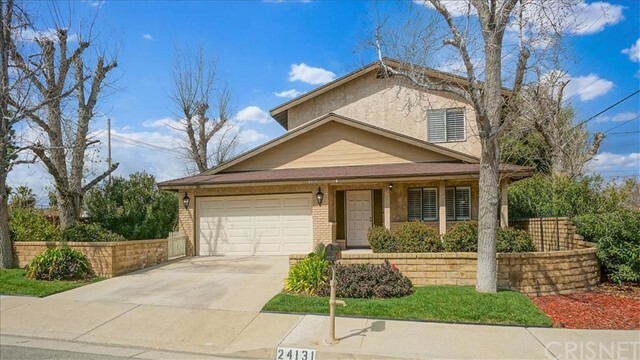 This home is conveniently located near the freeway, shopping, restaurants, and is a commuters dream! There is NO HOA or Mello Roos! To view any home available on the MLS using your smart phone simply open the web browser and surf to www.scvrealestatepros.com then click 'Search by House #'. You can also scan the QR Code at the top of this flyer to display more information.